I’m about an hour into Legend and it is a totally charming fantasy movie. It’s the kind of fantasy movie I would show to my hypothetical children if I wanted them to be well-rounded kids who like these kinds of movies. Also Legend seems like a good movie to scare the crap out of them. Making my hypothetical child watch Legend as a young kid is good for another reason. They won’t be laughing hysterically at the presence of Tom Cruise like I have been this entire time. Seriously, Tom Cruise in this movie is absolutely ridiculous to me. Please take a second and ponder about this carefully placed unicorn. Unicorn. UNICORN. With certain actors – Tom Cruise, Nicolas Cage – I have issues taking them seriously in their earlier roles because I only know them as tabloid fixtures from nowadays. Remember when Tom Cruise jumped on a couch? I was in high school. I missed the days when Cruise was mega superstar that Rosie O’Donnell pined for and instead I got the couch-jumping, Scientology-loving, Brooke Shields’ bashing guy. 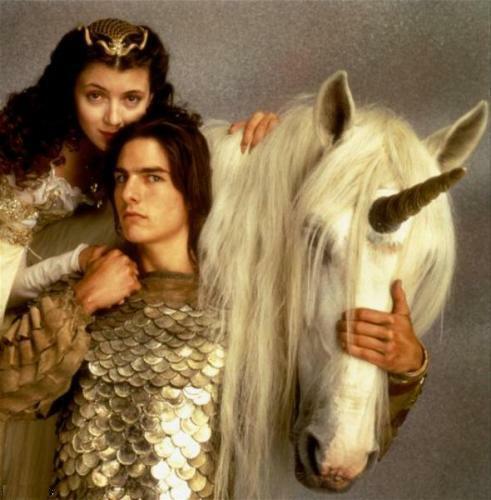 So watching Tom Cruise run around in an 80s fantasy film with some unicorns and looking like a sparkly gladiator, to me, is quite amusing. Then Tom Cruise in Legend also made me think about Robert Pattinson in Twilight. Don’t hurt me for going here, Kim.) Like how once Twilight is really over, R-Pattz will take over the world by controlling more than just the minds of tweens and he’ll be a huge movie star just like Tom Cruise in 90s. God, that is frightening. Clearly this blogging marathon is taking a toll on my sanity. Next movie!